Historians have long since debunked the legend that Abner Doubleday invented the game of baseball, but in 1939 the myth was alive and well. In celebration of baseball’s “centennial season” of 1939, each major and minor league club wore a specially designed patch commemorating the anniversary. 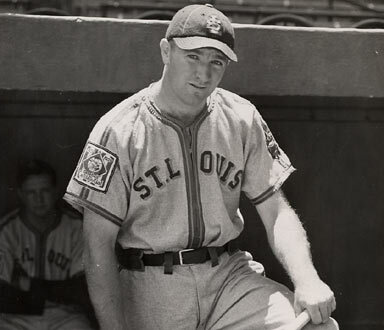 The patch was worn on the left sleeve of each club’s jersey except for that of the St. Louis Browns. Since 1937, the left shoulder of the Browns jersey had featured the team’s crest. 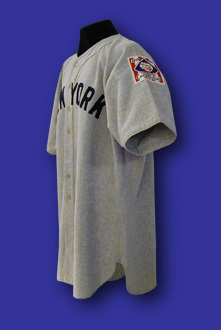 So for the club’s 1939 uniform, they placed the special “centennial” patch on the jersey’s right shoulder. No major league baseball was played on June 12, 1939, for on that day the eyes of the baseball-loving public were on Cooperstown, New York. The date marked the official dedication of the National Baseball Hall of Fame and Museum. In attendance were numerous baseball dignitaries as well as all 11 living Hall of Fame members: Grover Cleveland “Pete” Alexander, Ty Cobb, Eddie Collins, Walter Johnson, Nap Lajoie, Connie Mack, Babe Ruth, George Sisler, Tris Speaker, Honus Wagner and Cy Young.